Visit between November 23 and December 22 so that you can visit the traditional Heidelberg Christmas Market which has more than 140 stalls selling baked goods and handmade crafts. We are comparing Heidelberg Tour from Frankfurt 6-Hour Prices from leading ticket suppliers and Try to find you Cheap tickets prices on the market. Located in the Baden-Württemberg region, Heidelberg is a beautifully picturesque historic city located approximately 50km South of Frankfurt. Located on the River Neckar the medieval town boasts superb views of the lush green valley and is said to be one of Germany's most beautiful cities. The city is famous for its castle ruins and its university, this being the oldest university in the whole of Germany, it also has what is said to be the world's largest wine barrel! The old town has picturesque narrow cobbled streets that still retain historic half-timbered buildings making you feel as if you've stepped back in time as you admire the architecture styles that covers the periods of Gothic through to Renaissance. A must-do trip for anyone who enjoys visiting picturesque medieval towns! A great way to see more of Germany than just Frankfurt if you're short on time and just want a short introduction to the city of Heidelberg. History lovers, architecture lovers, photographers, and culture vultures will be very happy on this sightseeing trip. Your Experience With Heidelberg Tour from Frankfurt 6-Hour? 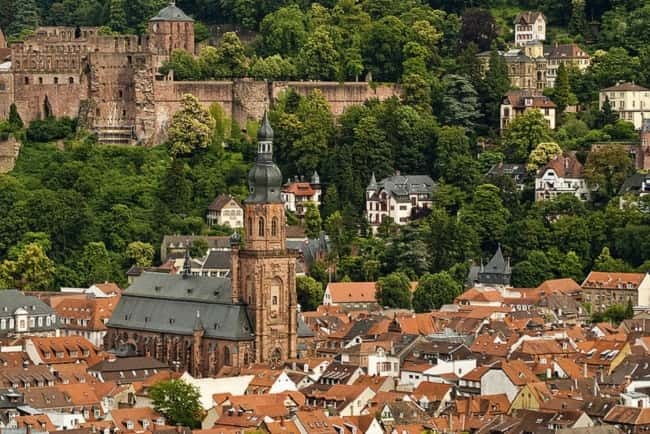 Departing Frankfurt from a central location you will travel 50 miles by coach to the beautiful city of Heidelberg with a friendly guide onboard to explain all about the city and the sights you will see. Upon arrival you will visit the world-famous ruins of Heidelberg Castle taking in the beauty of the mix of Gothic and Renaissance style architecture as you walk through the courtyards and and admire the panoramic views from the terrace over the stunning Neckar Valley below. You will also be able to see the world's largest wine barrel that is housed within the castle ruins - The Heidelberg wine barrel can hold 193 liters, which is more than 51 US gallons of wine! You will then enter the old town, making your way past the half-timbered houses in the narrow streets to reach the Old Bridge aka Karl Theodor Bridge, the Karlstor Triumphal Arch , the Haus zum Ritter aka The Knight's House, the Church of the Holy Spirit, and Heidelberg University which is the oldest in Germany. You will then make your way back to the coach for the return trip to Frankfurt. What Heidelberg Tour from Frankfurt 6-Hour Includes? A friendly and informative English and/or German speaking tour guide to explain the history of Heidelberg and the sights you will see. Entrance fee to the castle ruins and to see the world-oldest wine barrel. Return transport to Frankfurt by comfortable air-conditioned coach. When you book with GetYourGuide a packed lunch is also provided. If you don't speak German or English ask if there's an audio guide available in your language. Travelers Reviews about Heidelberg Tour from Frankfurt 6-Hour? This tour gets superb reviews on Tripadvisor, GetYourGuide, and Viator, many people giving it 5/5 scores. Everyone agrees that their tour guide was friendly and informative and really helped to make the day memorable and enjoyable. People describe the trip by saying "A Very Enjoyable Day', 'A Highly Recommended Tour', 'Would Do It Again'. The only negative points came from people wishing they had more time to explore the city, especially at the castle. Some people got unlucky with fellow travellers being loud and others had a very wet trip but over all everyone this trip gets high approval from everyone who has been on it. Printed tickets and e-tickets are both accepted. Check the weather forecast - You might need a waterproof jacket or umbrella.